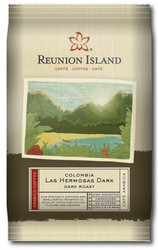 Reunion Island - Colombia Las Hermosas (Dark Roast) 24 Count. A co-op grown coffee that offers exceptional aroma and smooth, bright flavor. This is a rich coffee with hints of orange, milk chocolate, almond and floral with a creamy body. Each box has 24 bags and each bag is 1.75 oz. A co-op grown coffee with exceptional aroma and smooth, bright flavor. This is one of our "go-to" coffees when we have a taste profile that we just can't satisfy. It's a unique, classic flavor profile. You can really taste the quality, clarity and care that is given to this blend. Honestly, we have never understood why we don't sell more of this coffee, as it is something that we truly enjoy. Las Hermosas is the coffee plantation in Colombia where the beans are grown. It has won many awards and the contract for these beans was highly sought after. It is well known in the coffee industry as one of the premiere Colombian coffee farms. This is a much higher quality coffee than the traditional "100% Colombian" coffees that we have all become accustomed to seeing.